The Suzuki GSX twin. A plastic fantastic model from the 80s, with a timeless ability to look slightly uncool enough to inhibit a comeback. On the other hand, their ridiculously good engine build quality means that many a GSX has been dusted off, started happily, and ridden into the sunset. So how do you reconcile these two qualities? Capelo’s Garage, based in Oporto, Portugal has managed to do this, by breathing new life into a well parked 1987 GSX400, dubbed ‘the Dented Brat’. 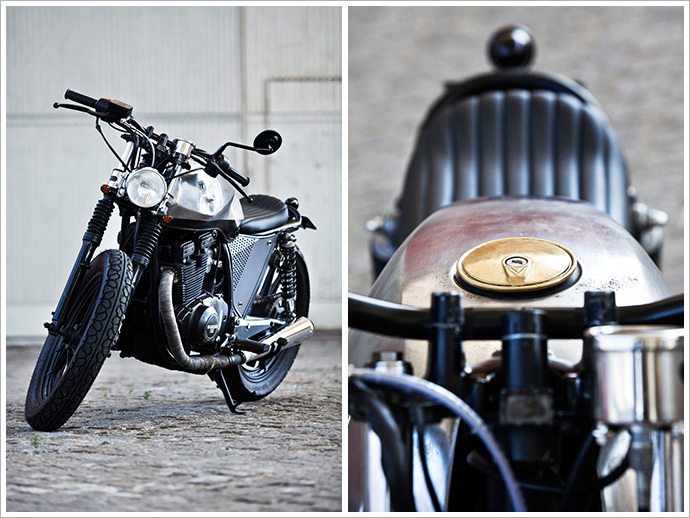 Nuno Capelo, the workshop’s founder, has built into it a dark metallic aesthetic that gives a big middle finger to the bike’s polyethylene clad beginnings, and shows the whole bike, scars and all. A year and a half ago, Nuno was in a small village in Portugal, looking over a freshly washed bike. This is a bike he had only seen in pictures, covered in dust. In person though it was much more impressive. After seeing it start first time, Nuno shook the owner’s hand, and he was the proud owner. First thing to go was all the unnecessary plastic. 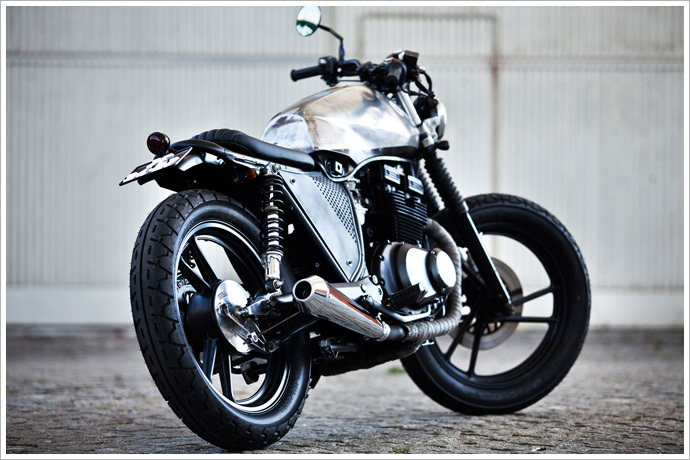 Blinkers and seat were given the flick, as Nuno envisioned a much darker look for the bike. Performance wise, the mods are simple but effective. Ditching the airbox, a set of pods have been mounted and the carbs rejetted to suit. At the tail end of the combustion cycle, the original exhaust tips have been replaced with a smaller set but no silencer, which according to Nuno gives a ‘phenomenal sound’. Brakes are standard, the big change being a change to steel lines on the front brakes. The rims are factory GSX, suiting the dark metallic look nicely. 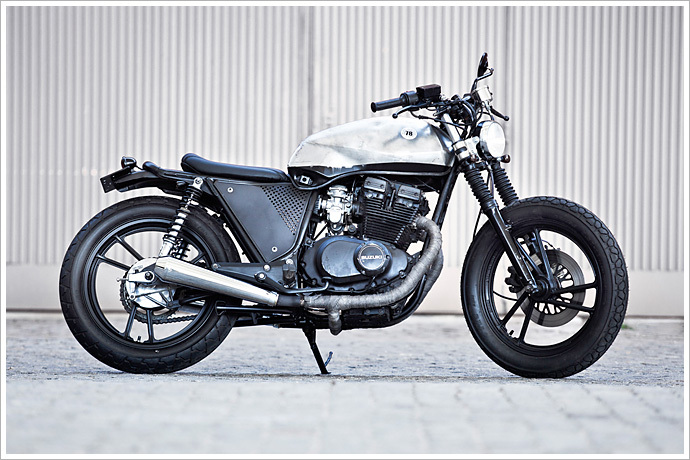 In relation to looks, the bike is definitely not the same as when it rolled off the Suzuki floor 16 years ago. The factory handlebars and mirrors are gone, replaced by Isl branded items. Sitting in place of the stock headlamp is a smaller unit, a light generally found on older 50cc motorcycles that are found in the area. 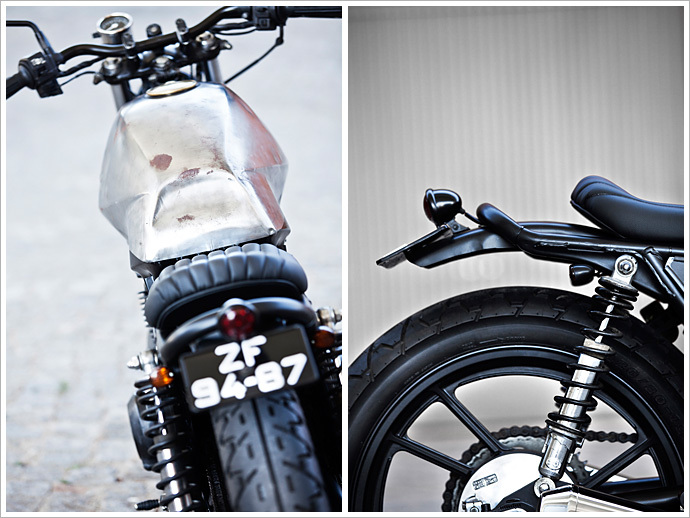 Three different seat designs were considered for the build, first a trimmed cafe racer seat for one. Then a two person flat tracker seat, and finally the one person bobber style seat you see today, mounted on a rear hoop fitted by Nuno. 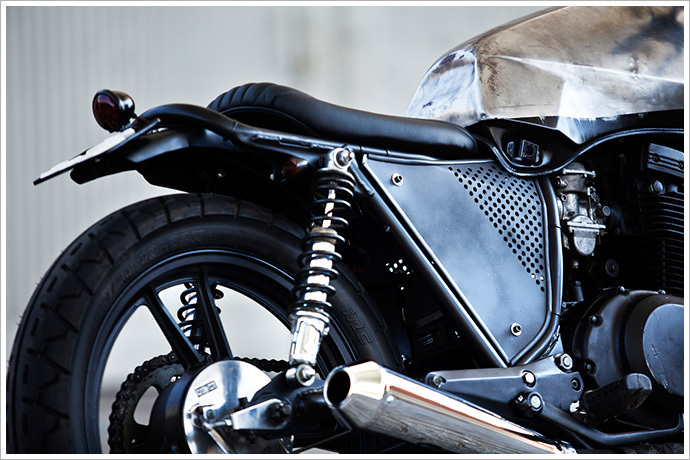 Catching your eye the minute you look at the bike, is the choice of aesthetic for the fuel tank. Much thought was put into this look, with people trying to influence the builder into painting the tank, but eventually the ‘Dented Brat’ was deemed to show it’s rough inside, including the dents on the tank. The side covers were a choice that was not changed at all from the beginning, they were going to be on the bike no matter what. It was decided that apart from having the rims, frame and a small line on the tank painted to delineate it, the rest of the bike would be left. 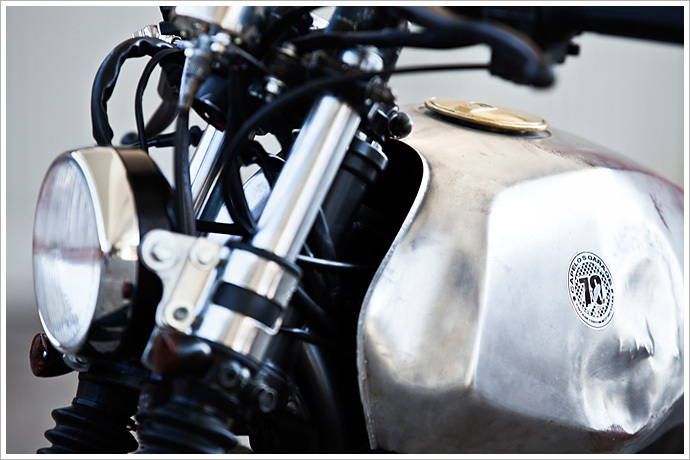 Or in Nuno’s words: ”leaving the other components with the existing patina and aspect when I bought it”. From a dusty bike found on the internet in a small village in Portugal, to the badass ride you see before you, I’m sure you can see the quality of the work coming from the Capelo’s bike studio. A warts ‘n’ all homage to everyone who can see the potential in a bike that has been parked, and inspiration to those who haven’t looked. I’ll leave the last words to Nuno Capelos himself: ”The bike is fantastic in terms of riding. Is fairly light and easy to ride. This is not a bike with a lot of speed. That was not the objective. I proposed to build a bike to ride and have fun. And that’s what I have done”.